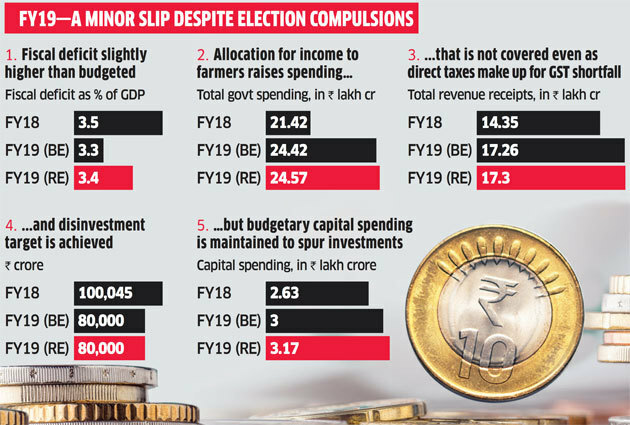 The government has almost met the fiscal deficit target for FY19, but election-year compulsions mean there is no improvement seen in FY20, which makes the much-delayed goal of achieving a 3% of GDP fi scal deficit target difficult. The government expects Rs 28,000 crore interim dividend from RBI in FY19 in addition to Rs 40,000 crore already received. The proceeds from RBI, PSBs and financial institutions is now seen at Rs 74,140 crore in FY19 against Rs 54,817 crore budgeted. A sharp rise in small savings has reduced the market borrowing needs of the government to meet the fiscal deficit. Rs 1.25 lakh crore is expected in FY19 against Rs 75,000 cr budgeted. 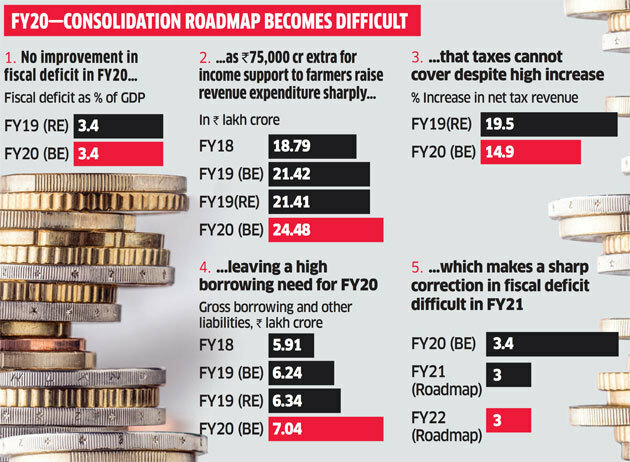 Rs 1.3 lakh crore seen in FY20 via this route. The tax to GDP ratio is budgeted to improve to 12.1% in FY20 from 11.9% in FY19 while tax collections are budgeted to rise 13.2% in line with the 11.5% increase in nominal GDP growth in FY20.